Hi, I'm new to this forum. 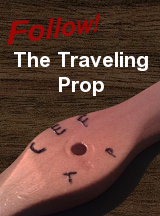 I have checked out many of the postings and found this site quite amazing. As a kid, I had many of the cox gas powered aircraft and vehicles (they just don't make toys quite like that anymore. I recently purchased a collection of toys mainly G.I. Joe stuff from an ex Hasbro employee. Included in the collection were two aprox. 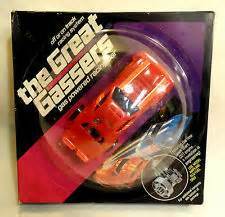 1/25 scale gas powered cars called "the Great Gassers" both the pieces are new never used. The guy that sold me the collection said he believes that these cars never came on the market. I would appreciate some help or history on these cars if there is anyone out there that has ever seen or heard of these vehicles. Well, WELCOME to the forum!! 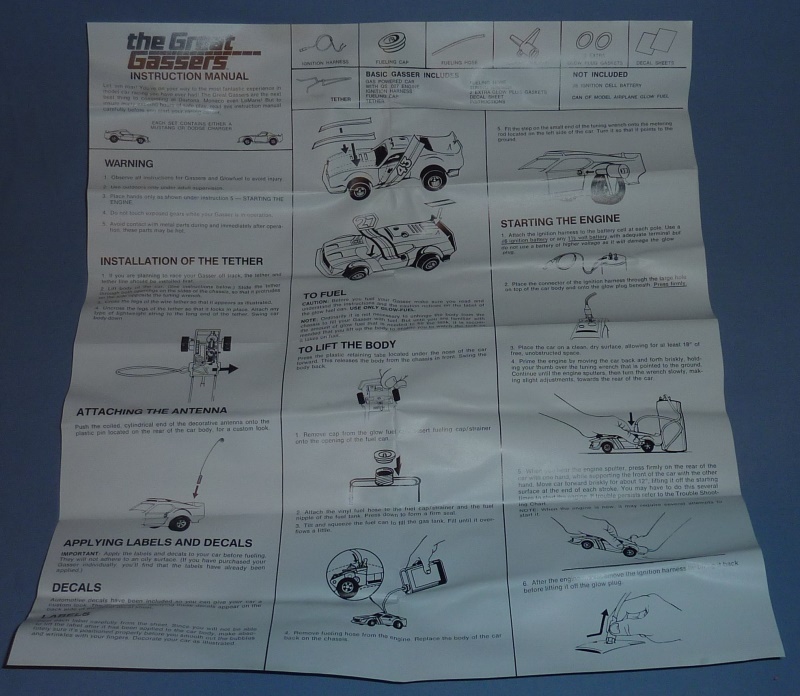 Those Hasbro Gassers look fairly unique? I've never seen one before. You'll have to pop open the body from the chassis and show some pictures of the engine to determine just who's or what engine is in there! hey? How did ya post pictures in your 1st post?? Give me a day or two I will take some better photos of the cars and engines. I'm still sorting the collection out. How did I post photos on my first posting? It actually took 2 attempts, but luck had a lot to do with it! I've heard of those.. Don't know much about the engines that were used though.. I have those on my eBay watch list. They come up from time to time, but the price always goes up above what I want to pay. You got to wonder if they never were offered for sale..why would they design, package, advertise, etc. and then not sell? If a product is not going to market you would think they'd pull the plug a lot sooner while it was still in preproduction. I've also seen guys claim they were made in the early 60's! THEY WERE RETAILED! But i don't think they sold very well. The first time I remember looking at these (while mom and dad shopped) was at a large store, they were dumped in a large discount bin. IMO, I remember they looked pretty cheesy and i hate to say even worse then the Testors cars. Now days since they're fairly rare they do bring pretty good money. The engine was made by a company called Cameron(?) and was less than .020 cu. in., but can't remember exact. Welcome to the forum Bill!! 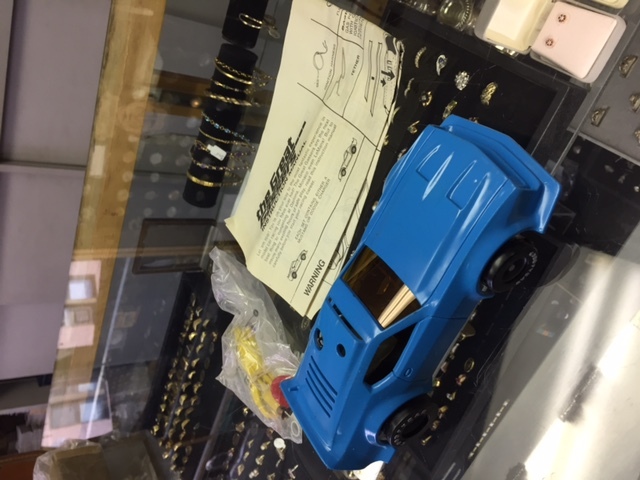 Cool toys , sounds like you got lucky grabbing those goodies from a former employee. 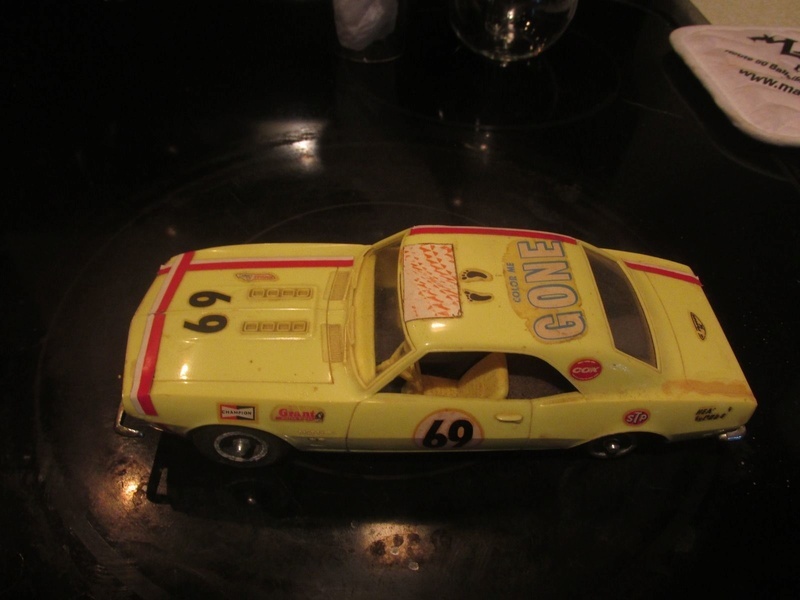 As promised I have gone through the collection I purchased and here are some better photos of the Great Gasser cars. One seems to be a 1972-73 style Mustang the other may be a Charger or maybe a AMC Javelin. I did not remove the bodies it appears that you need to unscrew the chassis to access the engine, since these are so mint I did not want to risk damaging them. According to the person who sold me the collection the packaging for these was not developed yet the boxes these are in were packaged in a master carton of ten pieces. He worked at Hasbro from 1969 to 1976, the collection included a bunch of G.I Joe stuff and these. Is this the engine? I remembered this photo from .049 Collectors Group. There is a story behind it but can't remember what it is. crankbndr wrote: Is this the engine? I remembered this photo from .049 Collectors Group. There is a story behind it but can't remember what it is. 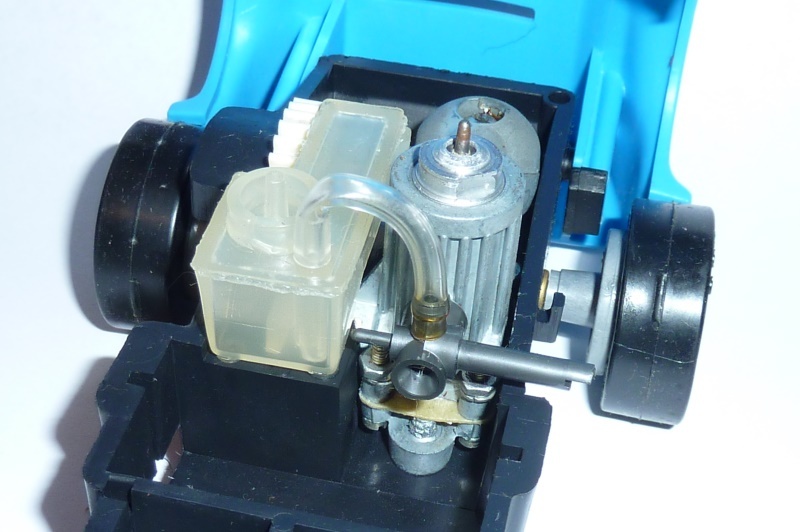 The other thread linked in my previous post has more info on the engine.. via a link to RC Groups. At least two sources confirm the "Cameron" engine to be of .027 size. Ultra-cool stuff for sure! You have to wonder what really happened to this product. So much of the info on them is conjecture. Maybe there were engine-starting issues leading to products being returned. Mark Boesen mentions as a youngster; seeing the "cars" in a discount/clearance bin at the store. 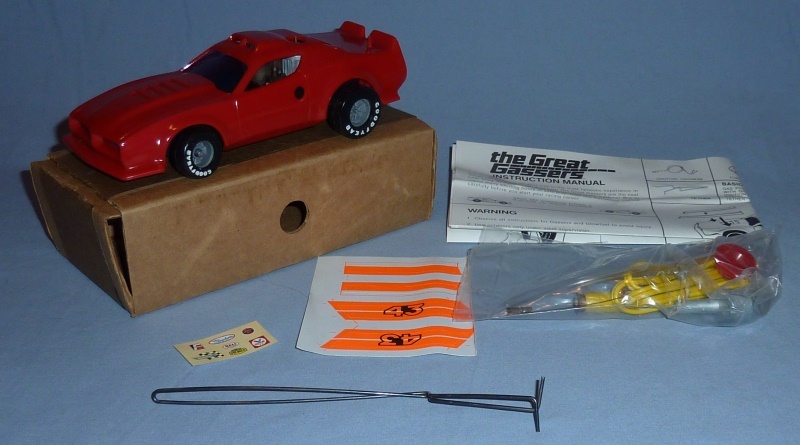 After all.. these were marketed as "toys".. and most parents who bought them didn't have a clue about trouble-shooting a tiny finicky model-engine. 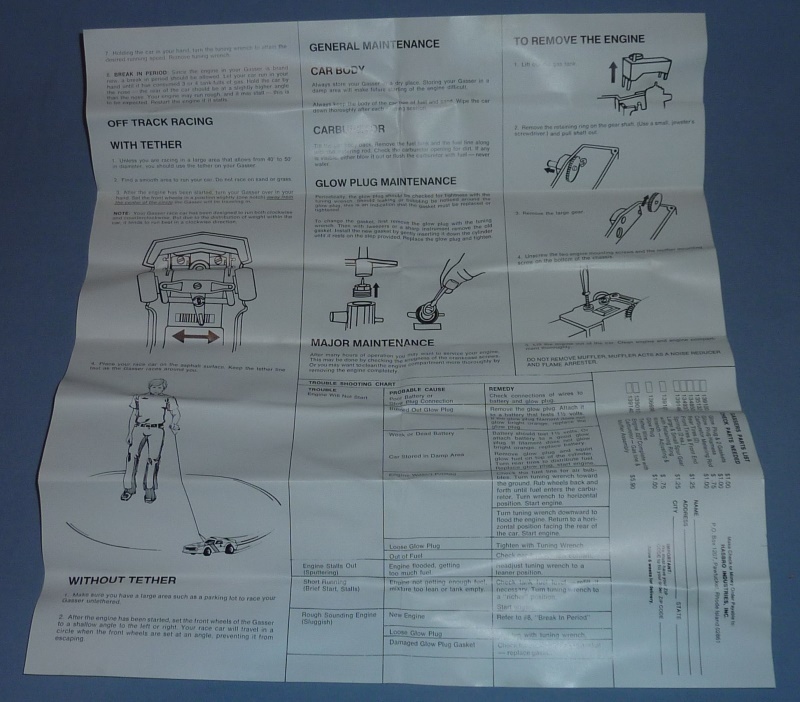 It is tough to read the instruction-sheet images posted.. but the section on starting the engine would seem pretty straight-forward for a person with previous experience. Most buyers of these cars probably had little to none. 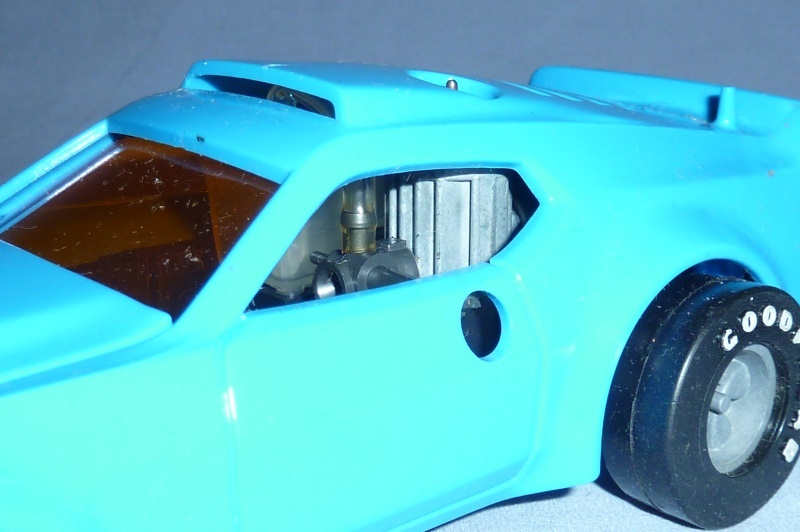 In my opinion; Hasbro dove into this concept "cold" in an effort to compete with Cox's Pee Wee powered cars of close to the same scale/function. 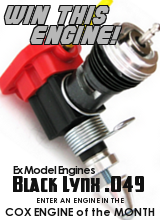 It's likely that more of the people who bought the Cox variants, had previous experience with Cox engines/products. Not to mention that the Cox cars were styled much more attractively. I'm pretty sure that the above images are all of the small Cox .020 powered cars. I think there was a Corvette too.. 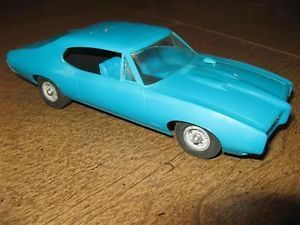 I would have probably opted for the Camaro as a kid in 1968.. but now as a bigger kid; I'd probably go for the Buick. Our "Bob" (rsv1cox) has a couple of Cox Buicks I believe. Hasbro was well-outside of their marketing-zone as compared to Cox. They must have spent and lost a good amount of capital on that product. Hasbro was a "toy giant" at that time though. The decision to contract with Cameron for the engine is interesting. 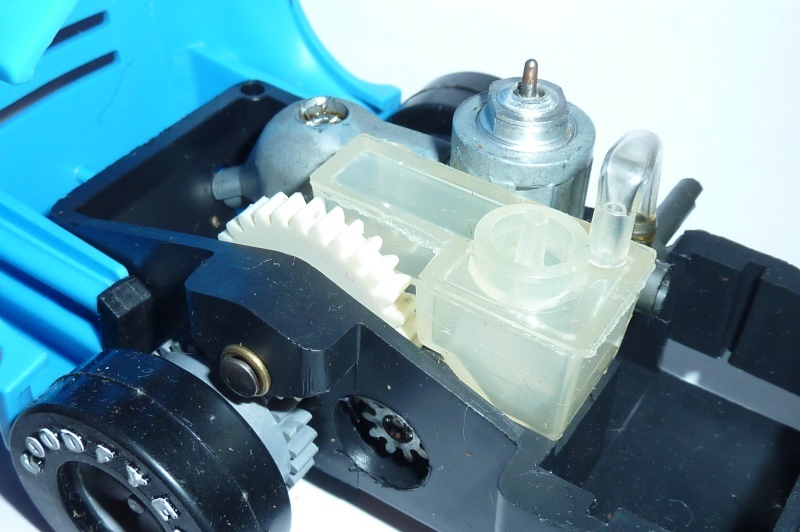 As can be seen on the bottom of the little Cameron engine; "Hasbro Pat Pending". I wonder if Hasbro attempted to strike a deal with Cox for the engines originally? That could have been a win-win if marketed properly. It would have been less risky for Hasbro at the time; given the reliability and popularity of the Cox engines by the early 1970's. Cameron was apparently still around at the time.. and had furnished Roy Cox with an .09 (?) 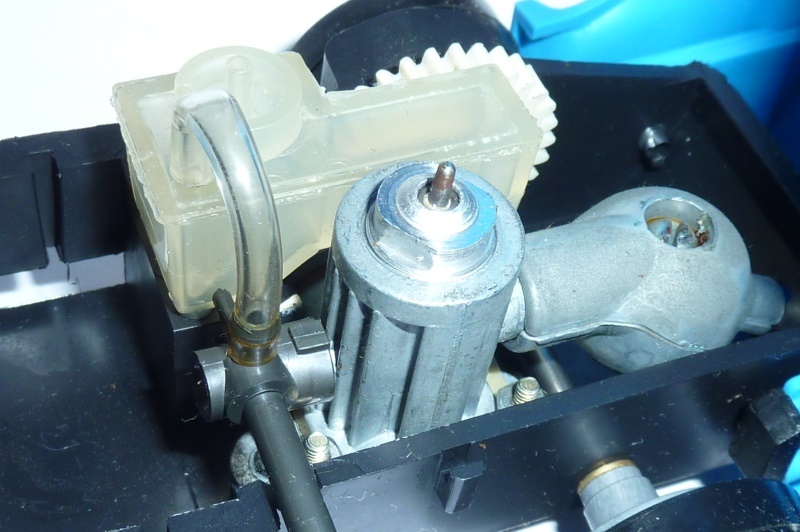 engine for his first tether-car several years earlier. Dooling may have been out of business by that time.. but McCoy/Testors was certainly alive and well.. 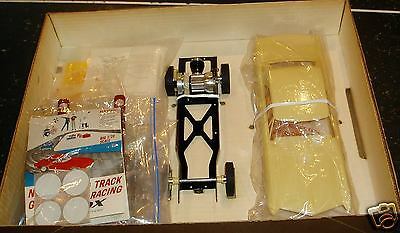 I'd personally like to know more of the story..
Do any of you people born in the early 60's remember the Mattel Hot-Wheels "Sizzlers"? 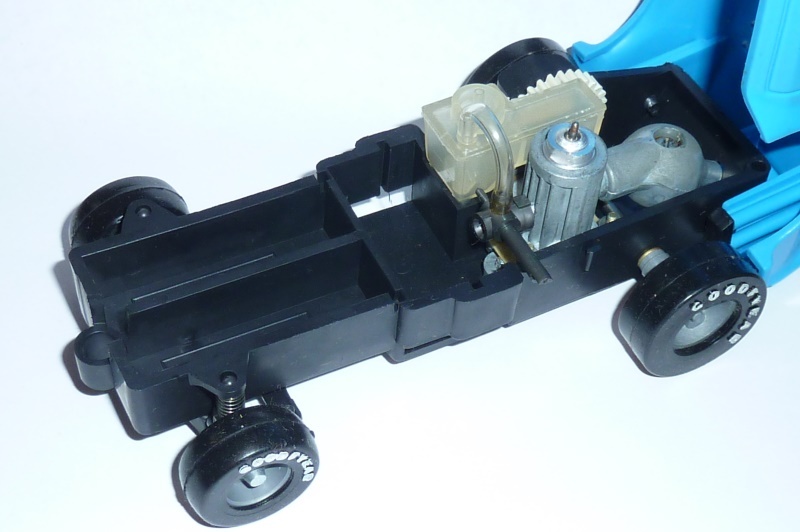 Mattel should revisit that concept again.. with the same gas-pump style charging-station.. and todays lithium battery technology. I'd "buy it now" at 57 years old! When all else fails, read the instructions! 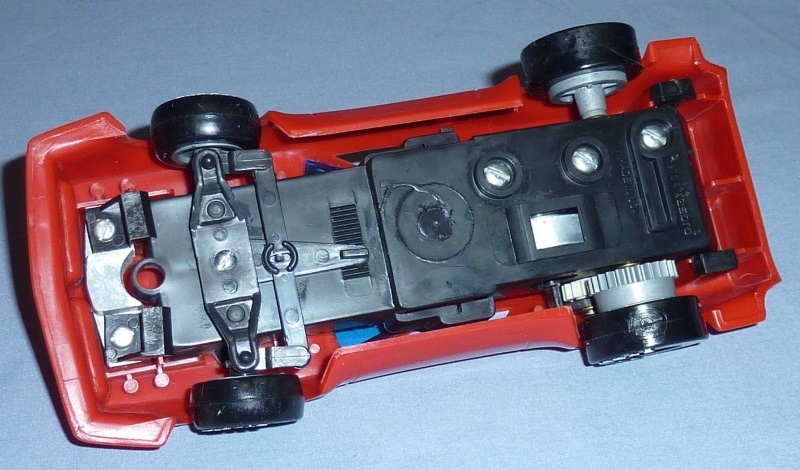 The bodies do flip up without unscrewing the chassis. Here are some engine photos. 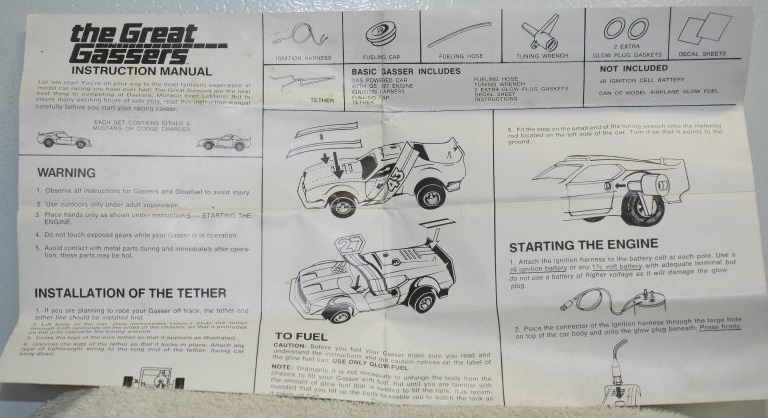 There is also a compartment in the front for two AA batteries although there is no mention on the instructions for installation of batteries. I wonder if these were originally designed to run with electric motors. 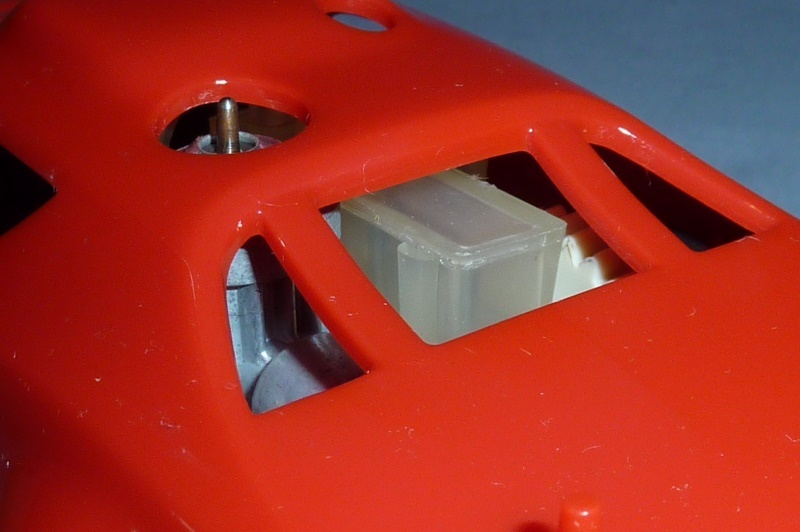 There are no contacts for the batteries but the plastic has the placement and orientation molded into the plastic. 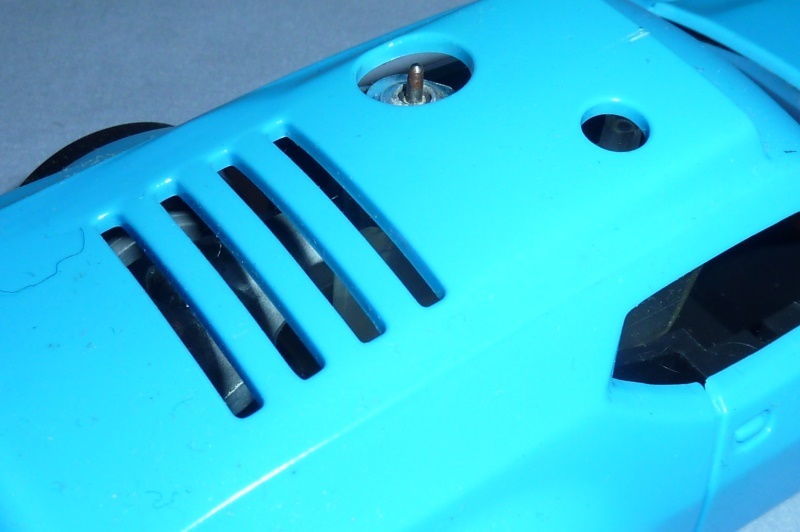 Thanks for posting photos, very interesting to see detail of engine/muffer, etc. It's fun to speculate what happened to them and/or why? I'm guessing after first shipment or two, they just didn't sell and production was canceled. For a car that never was retailed, it's odd that they keep showing up every now and then on aBay, often with the factory packaging? 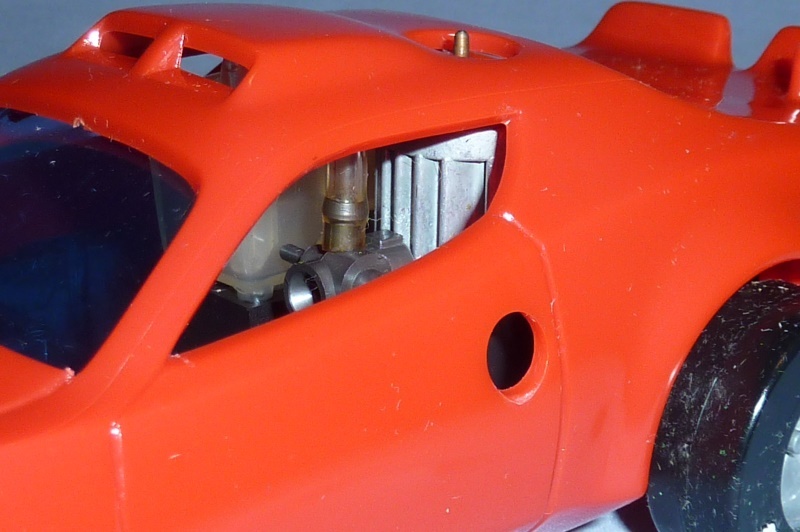 Several years ago somebody posted on one of the R/C forums that it was made in the early 60's and never went into production? The guy was mistaken on both accounts, yet the story still gets passed along as fact? If they just made them look more like the real thing I bet they would have sold well. 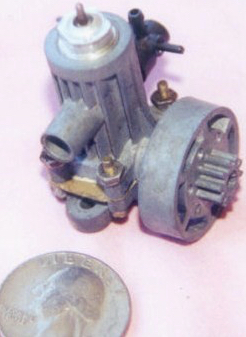 Side port engine. Meaning that it would happily run in either direction just like the Cox reedies. It's amazing how rough they look compared to the machined look of any Cox engine. I'd think that keeping rpm's under control until the car was launched could be a problem. All Cameron engines I've seen have those peculiar vertical cooling fins. I predict 23 watchers, 0 bidders. batjac wrote: Aaaannnnd, they're up! I think your predictions are "spot on"
I'll take a lesson learned from Mark Boesen and 049 collectors group, a picture is worth a 1000 words, but in this case, it'd be worth a $1000! Not feeling the need to have and hold em in my hands, the pictures are nice to look at. lol, i resemble that remark...years ago i pickup a early 60's mint Wen-Mac p-38, after 3-4 years of it setting on the shelf i felt i'd rather have the money. There is a large group of guys out there that have no problem buying all the cool toys, i'm just not one of them. I would not be surprised if the cars did bring a G note. The seller is in Woonsocket, RI.. which is about 5mi. from me. 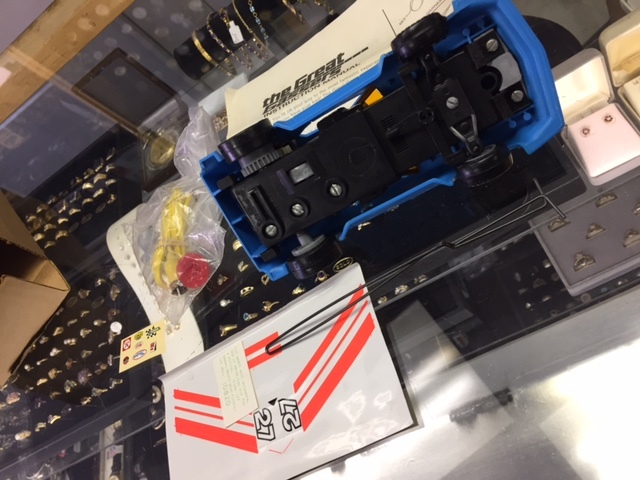 Cool story in the auction about how they were originally made in this area. Hello Bill, welcome to the forum, I am finally back on. I have asked my friend Robert Tondreau from Chepatchet Rhode Island to post about these cars as he knows a lot about them and even met the engineer of the project years back. 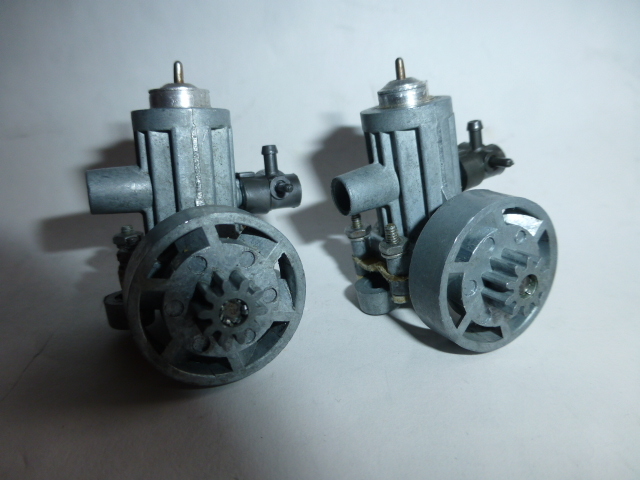 Some of the guys that post on this forum are members of the Model Engine Collectors Association and might remember when these Hasbro engines came up to sale in the swap sheet years back. If you like to see some other cars running I have the Cox car videos thru rc grabag on you tube! Enjoy! Bill Steklenski, Bucks County, PA.
Bill steklenski wrote: Hello Bill, welcome to the forum, I am finally back on. I have asked my friend Robert Tondreau from Chepatchet Rhode Island to post about these cars as he knows a lot about them and even met the engineer of the project years back. 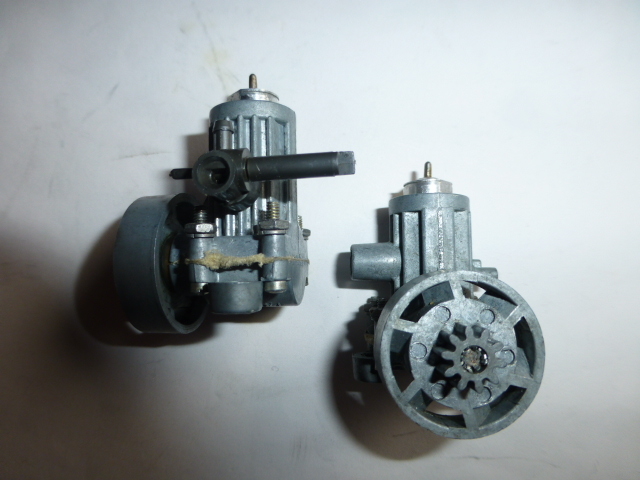 Some of the guys that post on this forum are members of the Model Engine Collectors Association and might remember when these Hasbro engines came up to sale in the swap sheet years back. If you like to see some other cars running I have the Cox car videos thru rc grabag on you tube! Enjoy! Bill Steklenski, Bucks County, PA.
Hi Bill S. I live in N. Smithfield, RI which is about a 10 minute drive from Chepatchet. Sure would be cool to meet and talk with your friend Robert Tondreau about these cars. Is he a hobbyist/small-engine enthusiast? 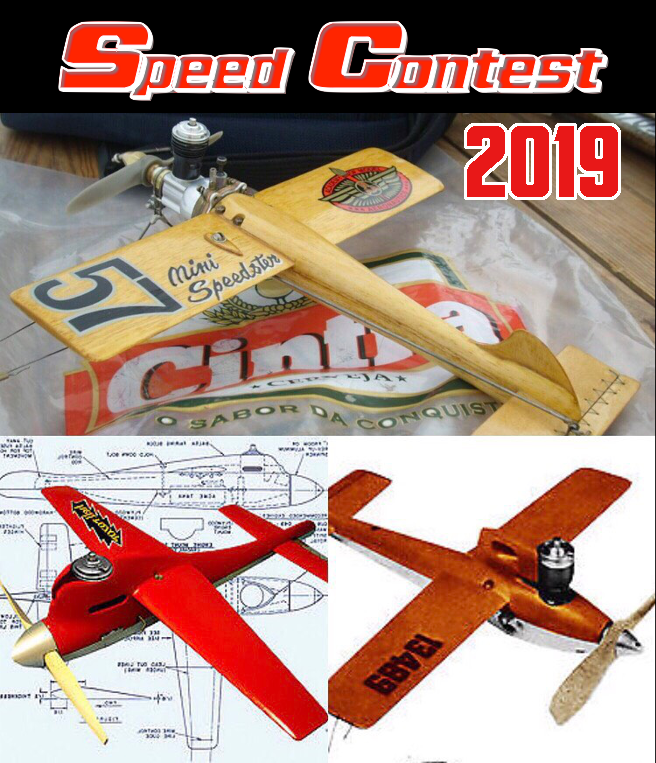 Yes, he collects the small model engines, cox planes, and is a expert in building free flight model airplanes. I believe now he is going to build a run of maybe 12 custom built 049 outboard engines. He also has built some incredible rc boats! I was just up to visit him labor day weekend and we ran some boats on Leech pond. My brother gave me a Lindberg Chris Craft sport fisherman and I am really enjoying it. Hoping to get it out this weekend at Lake Galena Peace valley park down here in PA. Rob should be posting the article soon so please be patient. Someone had mentioned that the engines had vacum problems when they got hot so that's why they may not have gone over that well. 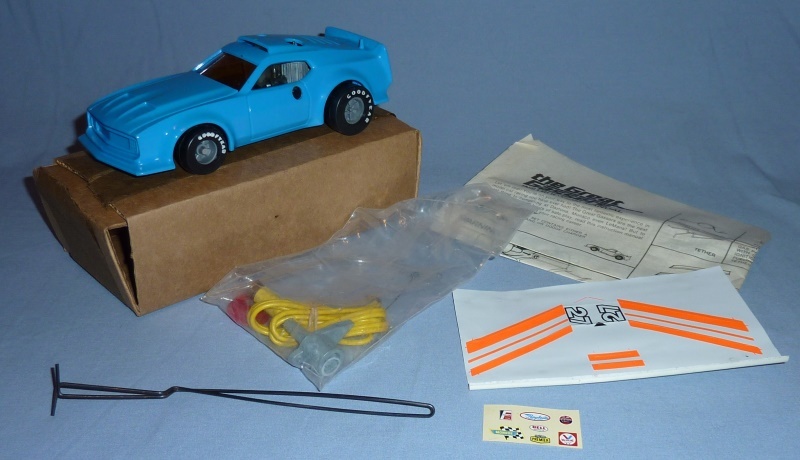 It is obvious that they were from the early 70's and if you see the front of the body looking like a mustang or charger and the back looking like a trans am I believe Hasbro would not have to pay a copyright fee or other? I know 5 collectors that have these cars and 1 is in reach, I would love to buy it and run it on 10 % nitro but don't want to damage the engine. Another person told me they called Hasbro not long after the cars came out and they denied ever producing them. I think that little 027 would run for a while if it was taken care of. Maybe it also was a scenario where the kids were not smart enough to get them to run and gave up on them. 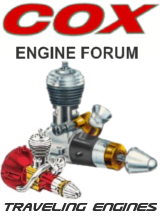 I can say for sure running my Cox cars since 2001 I have learned more about those engines than I new as a kid between 1971 and 1976. 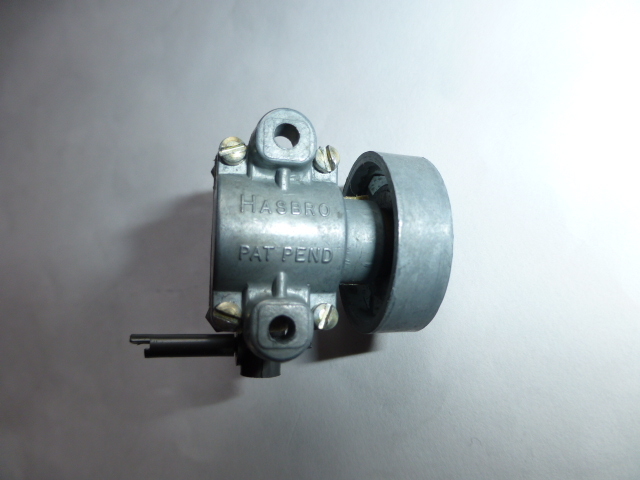 A few years back I installed a Tee Dee cylinder on the Cox jeep and had its RPMs up so high it ran in a circle for a few minutes and then poked a hole in the crankcase from breaking the connecting rod! !